The following product review is of Timeless Skin Lightening Cream. The manufacturer claims that this product is designed to deliver superior results, gradually lightening skin and dark spots. Can this product deliver on its claims? Is it the best skin lightener available on the market? For the answers to these questions and more, we have compiled a thorough review that assesses the product formula as well as examines aspects of customer service. The manufacturer claims that there are 4 skin whitening ingredients in 1 product, however, they regret to state which of the long list of ingredients are active. We have compiled a list of a few ingredients below that may contribute to this product delivering on its claims. The formula includes Kojic Acid, a popular ingredient used in skin lightening products for its ability to reduce hyperpigmentation by limiting melanin production. Licorice Root contains glabridin, a substance that inhibits the enzymatic reaction that results in pigmentation from sun exposure. Isopropyl Palmitate conditions and softens skin while vitamin E provides the skin with protection from oxidative stress. Hyaluronic Acid boosts collagen production to firm up skin and Squalane promotes skin elasticity and moisture. Although these ingredients may prove beneficial in fulfilling some of the manufacturer’s claims, the lack of patented ingredients is unfortunate. Competing products have up to 5 patented ingredients, including Alpaflor Gigawhite and REGU-FADE, which have been proven to reduce pigmentation while brightening the skin’s complexion. In saying so, this product is likely less effective than other brands on the market. Whatsmore, the lack of GMP certification is worrisome as we cannot be sure if market standard processes were used during manufacture. The manufacturer offers limited instructions of use, stating only that this product should be applied to the cleansed skin in the morning and evening. We are uncertain how much product should be used per application or the best way in which to apply the product. We cannot say if this product has an accurate concentration of active ingredients as this information is omitted from the Timeless Skin website. Therefore, we are uncertain if this product is, in fact, effective or not. 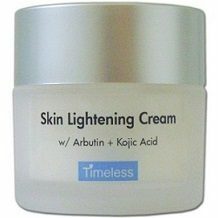 Timeless Skin Lightening Cream can be purchased directly from the manufacturer’s website. A 1.7 oz. tub or product retails for $21.95, which is relatively reasonable considering the lack of patented ingredients. However, it is unfortunate to note that the product is currently out of stock and we are uncertain when it will become available again. There are no discounts or package offers available for this product. Timeless Skin offers a 30-day period in which products bought from their site may be returned. This is positive to note, however, this policy is not extended to customers that have tested and partially used their product. This is unfortunate and brings the manufacturer’s confidence in the product’s efficacy into question. Furthermore, the lack of customer reviews may suggest that this product is not a popular choice on the market. With a lack of customer testimonial, we cannot say if this product is effective or not. This product contains many ingredients that may prove beneficial in delivering lighter and smoother skin. However, the lack of the concentration of these ingredients as well as a lack of patented ingredients to amplify results is a concern. This combined with a lack of customer reviews makes us question if this product can, in fact, deliver on the manufacturer’s claims. While the price is relatively affordable, the lack of availability may be a nuisance to potential customers. While there is a guarantee available for customers, it is limited. Therefore, we cannot recommend Timeless Skin Lightening Cream as the best skin lightener available on the market.